Members of the Cannon County Sheriff's Department have spent the last two days actively searching for a local youth who has been reported as missing. 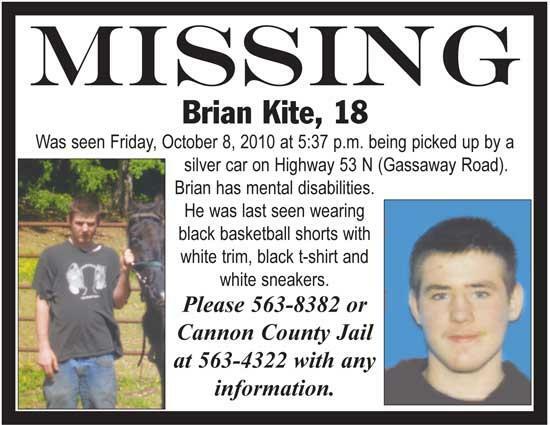 However, as of Tuesday morning, the whereabouts of Brian Kite, 18, remains a mystery. "We've had no clues, no leads," Detective James Davis said, "only a lot of rumors." Kite's family reported the young man missing on Sunday. He was last seen Friday evening getting into a silver car on Highway 53N (Gassaway Road). "We went out looking Sunday and Monday and we are following every lead we can find," Sheriff Darrell Young said, "and we will continue to look until we locate him." Sheriff Young said anyone with information about where Kite is or may be should call the sheriff's department at (615) 563-4322. Why have we waited so long about getting the word out about this young man that is missing. What kind of mental disabilities? I know Brian and I live in Pa. We are all praying for his safe return here. The cops there really need to get off their butts and look for him. He does have mental disabilities. Just because he is 18 doesn't mean that you dismiss that he is missing. Brian is my friend's son and he needs to be found NOW! What rumors??? Don't they realize a rumor could possibly have truth to it? How come they aren't following up on them? Didn't any one see him get into the car? I'm not in law enforcement, but I've read enough true crime stories to know they should be following up on everything! I'm of the opinion that they aren't taking it seriously because he's not an 8 yr old little boy. regardless of his age he needs to be found...NOW. Last I checked- I had not heard anything broadcast on the local news channels...why? Alexis, you need'nt disclose Brian's mental disabilites, they are no one's business but your families. As far as waiting so long, no one waited. My friend reported her son missing w/in the time required by law. This article was placed the next day. Laws need to be changed on how long a loved one is missing before it can be reported. 24 hrs is too long of a wait. So far there is no indication that the young man, who was reported as missing by his family, did not willingly go with whomever was driving the car. There is no known indication where that car went after it picked him up. There is no evidence of abduction or foul play. To suggest there is something the sheriff's department can or should be doing that it is not, without staying what that something might be, is pointless and useless in find terms of locating his whereabouts. It is pointless, but that doesn't alleviate the frustration his family and friends are feeling at this moment. We are scared, concerned, confused and angry. The police are the obvious targets of our blame and tantrums. This is venting, getting it out. We are praying for a safe return home for the young man. With the information Alexis just described I don't see how the police can not think there is some foul play here. Its sounds suspicious to me. Can he not be tracked thru his cell phone, is it one that has GPS? It totally sounds like foul play to me. If I'm not mistaken I think they did try to track his phone and they went to the area and he wasn't there. There are so many abductions everyday and they don't seem like foul play, that doesn't mean it didn't happen. If that is how they all would look at it then no one would search for anyone that goes missing. Brian's friends and family know how he is. If he isn't responding to them then there is something wrong. Seems to me if he was a friend of mine or a family member i would be out doing everything i could to help in stead of coming on here bad mouthing someone who is looking for him. I understand you are scared but turn that into something productive. If i was an officer i wouldnt want to talk to someone bad mouthing me. Just because they dont tell you every step they do does not mean they arent doing anything. Lex, I'm so sorry this is happening to you. Have the police spoken to Andy or his family! Tell your mom she's in our prayers and I love you!!! If I lived in Tennessee I would be out there helping them look for him, and the family is out there looking. Unfortunately I live in Pennsylvania and I can't be there to help, I can only pray and request for my family and friends here to pray as well. First let me say, if I lived in TN I would be out there looking and helping my friend as much as I possibly could. I live in PA, there's no way I can be out there physically looking. Brian's immediate family IS out there looking. They are searching every day. No one is really "bad mouthing" anyone. Venting frustrations, absolutely, but I am sure Brian's family is appreciative of any help the TN police are giving, I know being the friend of his mother, and being there when he was born, I'm appreciative. Can't help but be angry and think that they aren't doing all they could. Being a police officer is not about choosing who you want to talk to because someone says something out of frustration. Being a police officer or any other public servant is about helping people, regardless of their frustrations and/or anger. I'm sure the police realize the family is upset and need to lash out at someone.